← What’s in an arcade machine. Happy Junk Food Day. So many different foods, however I feel fries are probably the most popular. 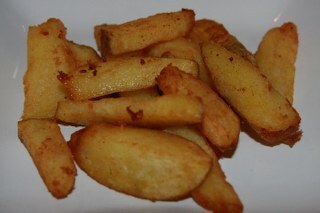 People have been enjoying french fries, for over 200 years. Thomas Jefferson wrote the oldest verifiable document mentioning frying potatoes, around 1802. French fries were very popular in france in the middle 1800’s. Which is why they’re called french fries. They became popular in the united states after soldiers returned, craving them. The biggest part of the fry’s flavor is from the grease. Tallow is the best, it’s simply rendered beef fat. If you can’t find tallow, you can get lard which is pig fat. Vegetable oils provide the least amount of flavor. This is why fast food places have until recently used tallow. McDonalds used tallow until 1990 when they switched to vegetable oil. To get the flavor, they added flavorings. Probably something like beef bouillon is sprayed on them, before being frozen at the factory. One quarter of all potatoes in america are served as french fries. On average each person in the U.S. eats 30 lbs a fries a year. Over 6 million pounds of fries are consumed each year, in the U.S.
1. Wash the potatoes. You can peel or not peel the potatoes depending on you preference. 2. 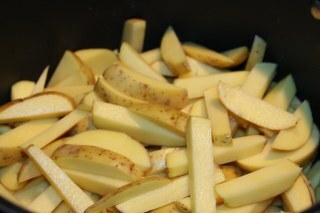 Slice the potatoes into thin strips about 1/3 inch wide. 3. Wash the potatoes then place in a pan of cold water. Add 2 TBS salt. Bring the water to a boil. If you’re using russets cook for 5 minutes. If you’re using a waxy potatoes cook for only 1 minute. 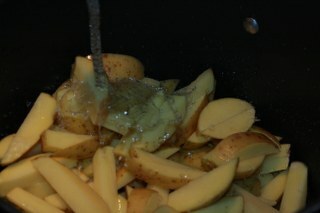 Boiling the potatoes first, creates a creamy texture in the finished fries. 4. Disolve 1 cup of sugar into 1/2 gallon of water. If you wish to use beef bouillon dissolve 4 cubes into the water with the sugar. Add ice to the water. 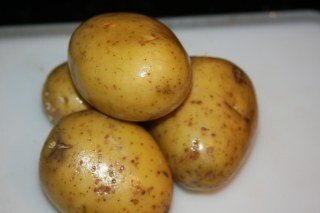 Drain potatoes, and place into ice cold water sugar solution. Stir fries around in the water to cool and coat all of them. After 30 seconds drain potatoes. At this point you can place potatoes in frigerator for later frying. The sugar solution, cools the fries so they don’t overcook, and coats the fries in a small amount of sugar, which adds flavor and helps to brown them. 5. Heat the cooking grease to 375. Tallow is the tastiest cooking grease. 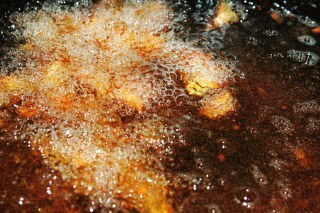 The place some of the potatoes into the grease. Not all of the potatoes at once, because that would drop the oil temperature too much. After 3-5 minutes the fries should start to float. Once floating using a slotted spoon, continue to check the fries until they are a golden brown. 6. Remove to a collander over a plate, to drain. Sprinkle season salt over fries. This entry was posted in Food, Holiday. Bookmark the permalink.